Everything. Library books. Thank yous. RSVP's. Emailing pictures. Blog posts. I guess tis the season to be behind in everything. First up is Monday's ScrapTiffany challenge. For Tiffany's birthday week, the challenge is to do a birthday themed project. My layout are some pictures of Little Man's blue frosting smeared face after his second birthday cake. I used lots of Scenic Route for this one. Anyone gonna miss them as much as I am? 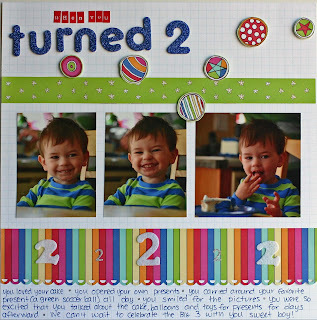 Be sure to stop by ScrapTiffany to check out the other fun birthday projects. Next up is a tutorial I did for the Color Me Daisy blog and forum. I made quick and easy glittered letters using a glue stamp pad. 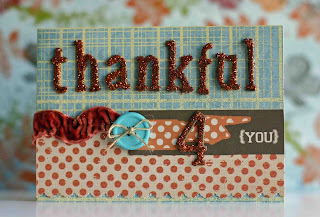 Here is the card I made (all from the November CMD kit) with my quickly glittered letters. Stop by the CMD blog for the whole tutorial. And finally some fun photos of the gingerbread house I made with the little monkeys. The house has long since been devoured. It was a kit from Target and I have to say, super delicious as well as super easy to decorate. It cracks me up how perfectly decorated the picture from the box is compared to the relative chaos that was our house. I made some hair for the gingerbread girl. Little Man wanted to do the hair for the gingerbread boy--it looks a bit like someone dumped a bucket of frosting on gingerbread boy's head! Little Miss was more interested in eating the candies than decorating them. Little Man preferred the frosting.